There will be a lot of wastage over the Christmas period and most of it will end up in landfill, so do the right thing for planet earth and buy some keep cups as presents for your friends and family members. Millions of non-recycable take-away containers are dumped each year and we all can make the very small effort of reducing our own waste by reducing the use of take-away coffee cups. At Chalkys cafe in Fremantle West End you’ll even get a free coffee when you buy a keep cup! It’s the last cafe in High Street, close to the historic Roundhouse. The WEST AUSTRALIAN reports in its property section today about exciting plans by the Yolk Property Group to build a six-storey commercial timber building in Fremantle on the corner of Josehpson and High Street, just opposite from historic Victoria Hall. If approved by Fremantle Council the building would use photovoltaic and renewable power battery storage systems and an operable facade to allow cool air into the building and release warm air from it. There would also be grey and storm water collection, and a recycling system for shower and handbasin water to be used to reticulate the green facade. The ground-level would be built using concrete but the levels above that would use mass timber and cross-laminated timber. Australia’s biggest ever weekend of treasure hunting will come to Freo when the City of Fremantle and Town of East Fremantle host a massive Garage Sale Trail this Saturday. The Fremantle event at the City of Fremantle’s recycling centre on Montreal Street will have 30 stallholders selling goods ranging from kitchen items and furniture to pot plants, vinyl records and second-hand clothes. It’s the first time in Garage Sale Trail history that two councils have pulled together to host a sale. The Garage Sale Trail will see more than 400,000 people rummaging through over 2 million items for sale at around 15,000 garage sales across the country. There will also be the Eat No Evil food truck, a coffee van, Buster It’s All About Play and expert advice from our Parks and Landscape team on creating your own verge garden. Garage Sale Trail is a run by Australian not-for-profit social enterprise Garage Sale Trail Foundation in partnership with over 140 councils around the country. The City of Fremantle’s Garage Sale Trail event is on Saturday October 20 from 8am – 2pm. For more information visit the City’s page on the Garage Sale Trail website. The City of Fremantle is moving towards the introduction of a new three bin system for household waste and recycling. The City of Fremantle is part of the larger Southern Metropolitan Regional Council (SMRC), where local governments in southern Perth work together to provide waste and recycling services for our residents. Since 2016 CoF have been working closely with the other member councils to assess the merits of the three bin system, including a trial with 7000 homes in the City of Melville. The results from the trial so far have been better than expected, with the bins being used correctly and less contamination of the FOGO bins than anticipated. Subject to final approval, the three bin system will be introduced to more than 13,000 residential households in Fremantle in July and August next year. The roll-out will include high-profile education program to let people know what to put in each bin and how the system will work. Because of issues with access and space the roll-out will not include high-density areas like the city centre and some town houses, commercial properties or residential complexes with more than four units, although this will be subject to review over time. The new system will mean the City will need to carry out an additional 400,000 bin lifts per year. The capital cost of setting up the system – including purchasing the new bins – will be around $1.2 million, while additional ongoing operational costs will be between $250,000 and $350,000 per year. The Fremantle Growers Green Farmers Market have taken on the challenge of banning plastic bags in the market and will join the Boomerang Bags project this Sunday. Boomerang Bags is a not-for-profit organisation whose aim is to reduce the use of plastic bags by engaging local communities to make re-usable (or boomerang) bags out of recycled material. It was only launched 3 years ago, and already 85,953+ Boomerang Bags have been made which has reduced plastic bag use by around 47 Million! There are already 273+ Boomerang Bags Communities underway with Fremantle now joining the cause. Growers Green have been trying to educate the stallholders, and most are on board but plastic continues to come into the market. This is mostly due to lack of planning, forgetting to bring your own bags for shopping, or spontaneously deciding to buy a few things. The organisers aim is to make 1000 Boomerang Bags for Fremantle to really make an impact and be as handy and accessible as the plastic bag. The important thing is they are free for the shop and free for the customer. Shoppers will be offered free-to-borrow, re-usable bags made by volunteers. It has been reported that Australian consumers use about 3.92 billion plastic bags per year, and it’s up to all of us to make a difference for the health of our environment and the animal life we impact. Boomerang Bags Fremantle are hoping that sewing groups, social groups, students and community members can help with this wonderful initiative and join on Sundays for bag making; or create their own bags to donate. All bags must be made from recycled fabric and there is a silk screen available for branding the bags. The market is on every Sunday from 8 am to midday at Annie Street in Beaconsfield. LET’S DO THE BASICS WELL FIRST FREMANTLE! The discussion last evening at the Strategic and Planning Committee of the City of Fremantle about a trial of grey water recycling at Leighton Beach was interesting, with Councillor Rachel Pemberton passionately wanting to go against the officers’ recommendation and continue with what she called a feasibility study which would make Fremantle a leader. The proposed collaboration on this with the imminent hotel development is not going ahead as the developers pulled out of taking part in the trial, and there are many unknowns and issues that in my opinion warrant caution. The treated grey water should not come in contact with humans, so how is one going to prevent that near a public beach? Water from sprinklers will be blown all over the place and footpaths by the wind, so can we take that risk? How safe is treated grey water for birds, insects and other wildlife? Why does a trial like that have to be near a beach, with Councillor Dave Hume repeating it would be better at South Beach. But it needs a substantial new development to make it work and there is none happening at South Beach. Should the small City of Fremantle really spend many tens of thousands of dollars on trying unproven new technology when no one else seems to want to give it a try? These kinds of projects should be run by state and federal governments but not by a small local government with little resources and income that is often struggling to find money for basic maintenance in our city. Fremantle needs to go back to governing for local people and stop pretending it is a state government, and that it needs to be a front runner and try out things we can’t really afford. Let’s do the practical and basic things first and well to look after our environment. Let’s protect mature trees, plant heaps of mature and semi-mature trees more, look after our reserves, parks, gardens, make laws that require all new development to have solar power and rainwater tanks, suggest solar awnings and blinds on buildings, etc. etc. There are so many more achievable things we can do as a small city instead of wasting money on an untried technology that the CSIRO should be testing. Written and authorised by Roel Loopers of 5 Maxwell Stre. Beaconsfield 6162. 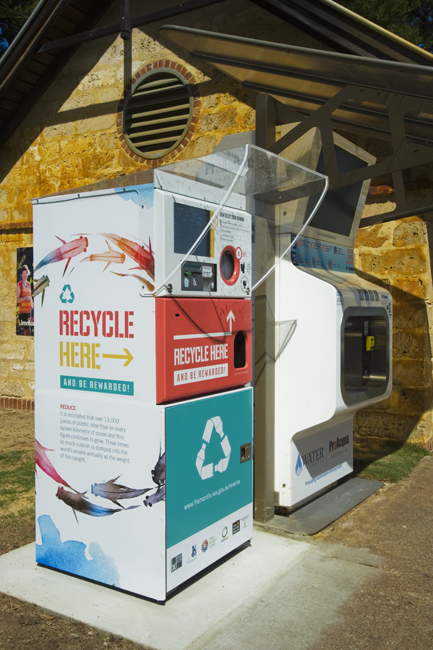 Fremantle people and visitors are getting rewarded for recycling plastic bottles when they put them in this new machine on the Esplanade Reserve. Tell your kids to start collecting bottles so they can earn some pocket money!